There are more spy cameras available on Ebay and Amazon than ever before. Unfortunately, with the rise of easy commerce with foreign vendors, many customers end up seeing the side effects. Many of these spy cameras come without needed drivers and software which means that you cannot even set the time and date stamp on the video from these cameras. If you purchased a spy camera from one of these vendors, and find yourself in this unfortunate situation, then you may have a completely unusable spy camera. Having the wrong time and date stamp on your video could mean that you have video that cannot be used in court, and/or is easily disputed by offending parties. For example, if you have a video that was shot on May 12th, 2015 showing that your housekeeper stole from you, and the date embedded in the video shows that it occurred on January 12th, 1980, then you may have a hard time prosecuting or even getting the insurance company to pay for the losses. This is why we produced a software that works with most generic spy cameras. We know how important it is to be able to use the video that you capture with your spy cameras. This quick and easy to use software will permit you to quickly update the time on many different spy cameras, syncing the time and date with the time and date on your PC. While we cannot guarantee operation with spy cameras purchased elsewhere, it works with many cameras that appear similar to the spy cameras displayed on the page. 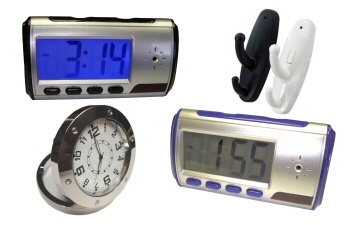 This immediately downloadable software lets you quickly update the time and date on many different nanny spy cameras (normally battery operated models) that do not come with the time update software (or come with unreadable chinese instructions and/or cd that cannot be read by your computer.